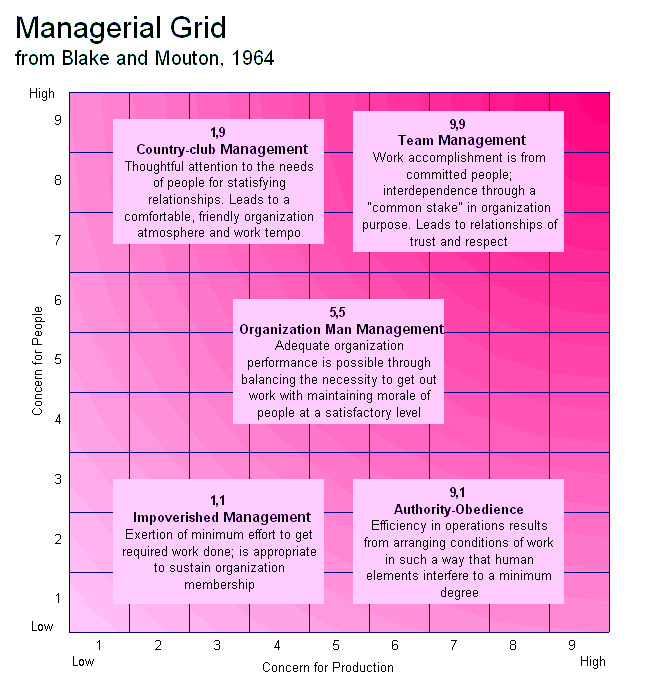 The managerial grid model (1964), developed by Robert Blake and Jane Mouton, is a behavioral leadership model. The model is an excellent way to map out different leadership styles, and an excellent way to evaluate the leadership performed by leaders and managers. 1/1 Is an impoverished management style with very little concern for the task or for the employees. 1/19 is a task management style where there is no regard for people, this is what you might find where people are working on piece rates or commission only; if the people fail to achieve targets they will soon find disciplinary action being taken against them. 5/5 is a middle of the road management style, this is a balanced view. 1/9 is the ideal “team manager” where both the task and the people are considered as very important. Paternalistic leaders have a dominant style where the leader will wield her power and influence and expect loyalty and obedience. In the paternalistic leadership style, there is still a great amount of authority, but this leader is more willing to help her employees become more efficient. This leader has compassion for her employees, yet she will make the final call. While the hierarchical distance between employees and manager is still significant, respect and admiration for the latter is a key component of successful paternalistic leadership. Democratic or participative leaders are effective and more productive because they consult subordinates on various matters and include them in the process of decision making. Tasks are assigned on the basis of interests and preferences of subordinates. Laissez-faire leaders have little or no self-confidence in their leadership ability, do not set goals for the group, and do not enhance group interaction and communication. In fact, the laissez-faire type of leader do little supervision. Consequently, the group has to make many on-the-job decisions. Situational leadership is about using the right person and the right style for the right situation. For example, a crisis will call for a more authoritarian leadership style whereas a laissez-faire approach can be adopted for managers with highly skilled and empowered staff. This suggests that managers and leaders must be able to change and adapt their style to different situations.